Four major categories of food items were determined in the gut content of chironomid larvae collected in the Curonian and Vistula Lagoons in the spring–summer period of 2009–2011. These were detritus (range from 88 to 92% of the gut content, by volume), matter of plant (2–7%) and animal origin (0.2–0.5%), and mineral particles (3–7%). Plant matter comprised pine pollen, conidia of fungi, cyanobacteria, green algae and diatoms. Matter of animal origin consisted of remnants of oligochaetes and rotifers. Food content was more diverse in the larvae inhabiting the Curonian Lagoon. The size of mineral particles in gut contents was significantly higher in C. balatonicus, although the distance between the bases of the maxillas, as a predictor of the size of the particles being eaten, was larger in C. plumosus. The gut content analysis suggested lack of clear food selectivity which potentially may lead to interspecific competition for food. However, the strength of interaction can be substantially weakened by several factors: (1) exceptionally favourable food conditions for benthic chironomids in both highly eutrophic lagoons, (2) the ability to occupy areas differing in salinity, (3) different feeding behaviour and (4) the ability to swallow particles of different size spectra. Benthic larvae of midges Chironomidae (Diptera) can be a major component of the fauna in brackish waters (Pinder 1995). Approximately 230 chironomid species occur in the Baltic Sea, constituting about 30% of the macrozoobenthos species (Brodin et al. 2013). Larvae are characterised by a relatively small size, but due to their fast growth rate, short generation times and often remarkable densities, their role in the functioning of ecosystems, involving both processing of organic matter and providing food for other animals, can be substantial. Knowledge concerning the autecology of particular species, however, is very limited because of taxonomic difficulties in identifying larvae to species level. This is particularly true for the genus Chironomus (Hirvenoja 2006). Its larvae belong to the dominant group of the zoobenthos of the lagoons located in the south Baltic region (Ezhova et al. 2005; Wolnomiejski and Witek 2013; Kornijów and Pawlikowski 2015). Karyological studies showed that in the Curonian and Vistula Lagoons, the genus is represented by two closely related pelophilous species: Chironomus balatonicus Dévai, Wülker et Scholl, 1983 and Chironomus plumosus (Linnaeus, 1758) (Markiyanova 2009, 2018). The distribution of the two species, which differ in their osmoregulatory capabilities, is affected by the salinity gradient (Markiyanova and Ezhova 2013). In the Curonian Lagoon, C. plumosus, typical of freshwaters, occupies a much larger area than C. balatonicus, considered as brackish water species. In the Vistula Lagoon the opposite is true. Their ranges only overlap in small areas of either lagoon, such as in the least saline northern part of the Curonian Lagoon, and the mouths of the biggest rivers flowing into the Vistula Lagoon (Markiyanova 2018). Colonisation of different areas can be related not only to preferences regarding water salinity, but also to the food base and its availability, as well as differing feeding preferences of larvae. The latter issue has been relatively well described in the case of C. plumosus (McLachlan 1977; Izvekova et al. 1983; Berg 1995; Proulx and Hare 2014), but less so for C. balatonicus (van der Velden et al. 1996; Smit et al. 1993). Moreover, information available in the literature concerns only populations inhabiting inland freshwaters, and data from marine areas are not currently available. This paper concerns the ecology of C. balatonicus and C. plumosus living in two lagoons in the south Baltic Sea: the Vistula and Curonian Lagoon. The primary aim is to determine and compare the food composition of larvae of the two species inhabiting different ecosystems. The secondary aim is to explore the possibility of competitive interactions between the species, which is an issue that has rarely been investigated in Chironomidae (Armitage et al. 1995; Galizzi et al. 2012). The Curonian Lagoon (CL) and Vistula Lagoon (VL) are choked, non-tidal south-eastern Baltic coastal water bodies, each connected to the sea by a single inlet. The surface area of the lagoons is 1584 km2 and 838 km2, respectively. Each lagoon is divided between two countries: VL lagoon between Poland and Russia, and CL between Russia and Lithuania (Fig. 1). The lagoons are shallow with mean depths lower than 3.8 m, and maximum lower than 6 m. The salinity range in both basins is similar (approximately: 0.5–7.5 PSU) with a distinct gradient from the sea connections towards the inner basins. CL is freshwater in its wide southern and central part, being under the hydrological influence of the Nemunas River, while the majority of VL is brackish with a high rate of water exchange with the Gdansk Bay. Bottom sediments are primarily composed of sand in the hydrodynamic-active, shallow zone up to the depth of 1.5–2.0 m. Deeper sediments are dominated by muddy fractions (Zachowicz et al. 1995; Chechko 2008). The lagoons are very productive, with eutrophic processes (up to hypertrophy) more advanced in CL (Gasiunaite et al. 2008; Nawrocka and Kobos 2011). They are also well mixed with negligible thermal stratification and continuous resuspension. Concentrations of suspended particulate matter in CL and VL are 25–66 mg/l and 10–85 mg/l, respectively (Chubarenko et al. 1998; Pustelnikovas 1998). In both lagoons, the near-shore littoral is occupied by an intermittent belt of reed Phragmites australis (Cav.) Trin. ex Steud., cattail Typha spp., or lakeshore bulrush Schoenoplectus lacustris (L.). Scattered patches of submerged vegetation which is resistant to wave action occur up to the depth of approximately 1.5–2.0 m and consist mainly of the perfoliate pondweed Potamogeton perfoliatus L. and sago pondweed Stuckenia pectinata (L.) Börner (Gasiunaite et al. 2008; Kornijów 2018; Bucas et al. 2019; Pawlikowski and Komijów 2019). The climate in the south-eastern part of the Baltic Sea, where CL and VL are located, is transitional, from moderate marine to moderate continental. The material for the study was collected in 2009–2011 between May and July. Sampling was carried out at five stations in CL (three located in the Russian and two in the Lithuanian part of the lagoon), and six in VL (three of each on the Polish and Russian side) (Fig. 1). The time of sampling was dictated by the occurrence of the IV instar of Chironomus larvae. This is the stage which allows karyological analysis, necessary for the identification of the closely related species of the plumosus group. Benthic samples were taken with an Ekman grab and washed gently through 0.5 mm mesh. Chironomid larvae were picked from the sediments and fixed immediately in the field with a mixture of 96% ethanol and glacial acetic acid (3:1) for karyological analysis, or a 4% formalin solution for diet studies. In the northern part of CL and south-western part of VL, where the range of both species overlaps, all larvae collected were identified to species by means of the karyological method. In the areas where only one of the two species occur (Markiyanova 2018), the karyological analysis was carried out on every few randomly selected larvae. We used the ethyl–orcein technique for the preparation of polytene chromosomes from salivary gland cells (Demin and Shobanov 1990) and cytophotomaps by Kiknadze et al. (1991). A total of 35 slides of polytene chromosomes were prepared and analysed. The food composition of the IV instar larvae was studied microscopically. The gut content of each larva was placed in a mixture drop of glycerol and water (1:1), evenly distributed over the microscope slide, covered by a cover glass, and analysed under a microscope at 300× and 600× magnification. All the items found in the gut contents were considered a food component. The frequency of a given food item was calculated as the ratio of the number of the larval guts in which the item was present to the total number of the analysed larvae. The relative proportion of each food item was estimated visually by the volumetric method, where the guts of chironomids were approximated to cylinders (Cheshire et al. 2005). The food contained in the guts was assumed as 100%, and the proportions of different types of food were estimated using an eyepiece micrometre scale of 10×10. Chironomid larvae do not have a clearly defined mouth opening (Sæther 1980), and therefore, it is not possible to define its width precisely. Instead, we measured the distance between proximal portions of the maxillae, which we assume determines the size of the swallowed particles, since they do not move relative to other parts of the mouth, being permanently attached to the anterior edges of the cheek sclerites (Fig. 2). Before the measurement, head capsules were separated from the larval body, placed on a microscope slide in Berlese’s fluid, and covered by a cover glass. We analysed the gut content of a total of 35 C. plumosus larvae and 53 C. balatonicus larvae. The different number of larvae of each species was a result of the fact that the larvae were indistinguishable at a morphological level, and had to be genetically identified after the diet analysis. Therefore, we could not predict in advance how many larvae of a given species would be subject to further analysis in terms of food composition. The saturation curve plotted for each species (Fig. 3) showed that the full spectrum of food was achieved after the analysis of the gut content of 15 larvae. Therefore, at least 15 larvae of each species from a given part of each lagoon were analysed, unless more individuals were collected, in which case all larvae were analysed. The Mann–Whitney U test was used to verify statistical differences between the size of mineral particles ingested by the larvae. The comparison of the food spectra of C. plumosus and C. balatonicus larvae employed the coefficient of Bray–Curtis similarity, based on the frequency of occurrence of items found in the larval guts. The results are presented in the form of similarity dendrogram showing a hierarchical clustering of objects. The following four major categories of food items were found in the guts of C. plumosus and C. balatonicus larvae collected in the two lagoons: detritus, mineral particles and matter of plant and animal origin (Table 1). Detritus was a mixture of amorphous organic particles, slightly decomposed fragments of macrophytes, exoskeletons of crustaceans and head capsules of chironomids. Plant matter was represented by pine pollen, conidia of fungi, cyanobacteria, diatoms and green algae. Animal matter consisted of remnants of oligochaets and rotifers. Detritus and plant matter occurred in all larval gut contents. The frequency of animal matter was between 3 and 80% and was much higher in the larvae inhabiting CL. Mineral particles occurred at a frequency between 82 and 100%. The number of food components in the gut content of the larvae of C. balatonicus and C. plumosus in CL was considerably higher (27 and 26, respectively) than in VL (19 and 20) (Table 1). Food components which were present in both CL and VL larvae comprised 66% of the diet of CL individuals, but only 33% of VL individuals. This indicates that the diet of VL larvae was more diverse. This is confirmed by the dendrogram (Fig. 4), which shows that the diet of both species in CL are quite similar, while the diet of the two species in VL is relatively more distinct. Detritus made of the largest proportion, by volume, of the larval diet. The remaining components constituted less than 10% (Table 2). Most of the food items were less than 50 μm. Some fragments of macrophytes and invertebrates were larger, up to 100 μm wide and up to 600–700 μm long (for example, oligochaetes). There was a significant difference in the linear size of mineral particles found in the guts of the two species (Table 3). 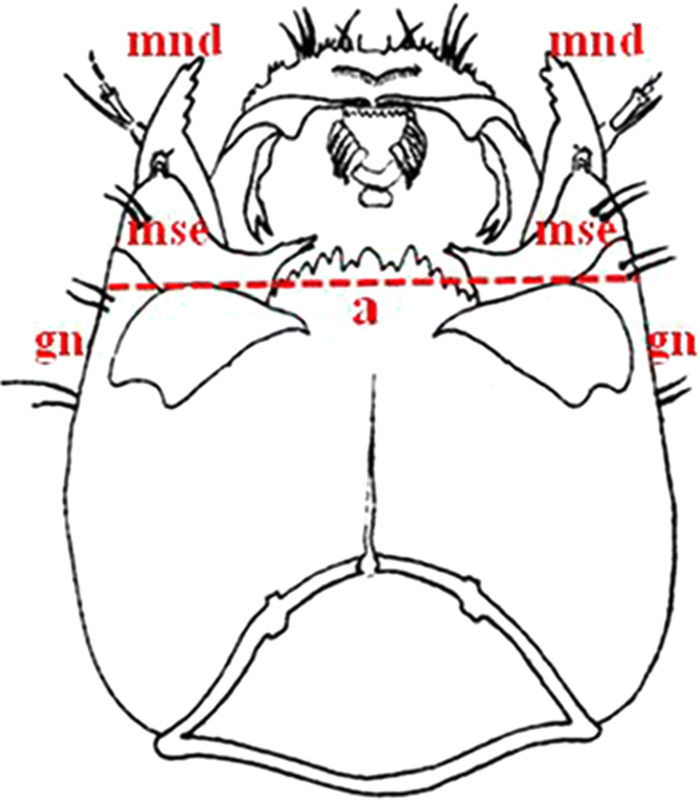 Both their length and width were larger in C. balatonicus (the Mann–Whitney U test (Zlength = − 6.16 and Zwidth = − 7.35, p < 0.0001). In contrast, the distance between the bases of the maxillas (Table 4), as a predictor of the size of the particles being eaten, was larger in C. plumosus, as confirmed by the Mann–Whitney U test (Z = 5.99, p < 0.0001). The main food component of C. balatonicus and C. plumosus in the two lagoons studied was detritus, constituting about 90% of food volume. Detritus is also the main component of food in other species of the genus Chironomus (Kajak and Warda 1968; McLachlan 1977; Izvekova et al. 1983; Berg 1995; Dukowska et al. 1999). Detritus as a complex of dead particulate organic material typically includes bodies or fragments of dead organisms as well as faecal material and is colonised by communities of various microorganisms decomposing (or remineralising) the material. The bacterial part of the detrital complex has been long considered to have the greatest nutritional value for chironomid larvae (McLachlan et al. 1979). However, due to the lack of long-chain linolenic polyunsaturated fatty acids as well as sterols in bacteria, it has been shown that bacterial carbon may not be quantitatively important for macroinvertebrates (Goedkoop and Johnson 1994). Bacterivorous Protozoa (heterotrophic flagellates and ciliates) may provide the crucial link between the microbial loop and the dietary requirements of macroinvertebrates (Cammen 1980; Carlough and Meyer 1989; Zhukova and Kharlamenko 1999; Wieltschnig et al. 2008). However, the analysis of larval gut content applied in our study did not allow for taking this potentially important food fraction into account. Microalgae found in the larval guts were dominated by planktonic forms. Their taxonomic diversity was higher in the gut contents of larvae from CL (Table 1), probably reflecting higher diversity of phytoplankton in that lagoon. Frequently occurring taxa included diatoms, green algae, and potentially toxic cyanobacteria such as Microcystis sp. and Aphanizomenon flos-aquae, typical of both lagoons in the spring–summer season (Rybicka 2005; Pilkaityte 2007). Microscopic algae, especially diatoms, are often rich in protein and essential fatty acids and may therefore be considered as high-quality food for growing larvae (Kajak and Warda 1968; Johannsson and Beaver 1983; Ahlgren et al. 1997; Goedkoop et al. 1997; Gullberg et al. 1997; Dukowska et al. 1999; Vos et al. 2000). Cyanotoxins in turn can be accumulated in the tissues of chironomid larvae with no visible damage to the community, constituting an important vector of toxins to higher levels in aquatic food chains (Kaczorowska and Kornijów 2012; Toporowska et al. 2014). Food of animal origin, with a proportion not exceeding 1%, was of marginal importance. Similar values are also provided by other authors (Kajak and Warda 1968; Johnson 1987). It is assumed to be ingested as animal remains together with detritus (Sadler 1935; Izvekova et al. 1983). Small invertebrates (copepods, rotifers, chironomids, oligochaetes), however, especially when occurring in high numbers, can be actively preyed upon by Chironomus larvae (Loden 1974; Izvekova et al. 1983; Ptatscheck et al. 2017). In our research, this seems likely especially with regard to the filter-feeder C. balatonicus, the gut contents of which contained a higher frequency of planktonic rotifers. In contrast to organic matter crushed by the larval mouth apparatus, mineral particles might seem like a good measure of the maximum particle size that larvae are able to ingest. Larvae turn particles along their long axis (Izvekova et al. 1983) when swallowing, so both the length and width of particles could be important considerations. However, the results presented here indicated that particle size was not morphologically constrained, as the species with the smaller mouth opening (C. balatonicus) actually appeared to consume larger particles. This may be explained by the fact that C. balatonicus, as a deposit feeder, has at its disposal, heavy or large deposited particles with a relatively small specific surface area which sink quickly. In contrast C. plumosus, as both a deposit and filter-feeder, in addition to deposited particles, also eats particles suspended in the water, dominated by slowly falling small particles. The larvae of this species also often inhabit areas closer to the banks, where resuspension of small articles is common. Moreover, the larvae preferring low salinity usually inhabit mouths of rivers, where small particles may be proportionally more available. Results of our research support the common opinion that both food availability and foraging behaviour are the two major factors responsible for Chironomus gut content (Sadler 1935; McLachlan 1977; Izvekova et al. 1983; Johnson 1987). The diet of the two species was similar in CL, but differed in VL as shown on the dendrogram (Fig. 4). This can be explained by a different spatial arrangement of food resources—uniform in CL and diverse in VL. CL is a rather homogenous basin, being triangular shaped with strong exposure to wind and wave action (Gasiunaite et al. 2008). In contrast, VL is an elongated basin with a clearly marked salinity gradient—from almost freshwater part of the western part of the lagoon fed by rivers to the more saline eastern part being under the influence of the sea, that strongly affects phytoplankton composition (Kruk et al. 2016). Therefore, it is not the food selectivity of the larvae, but differences in the food base within the lagoons that seem to determine the composition of the food ingested by the larvae. According to the competitive exclusion principle (Hardin 1960; MacArthur and Levins 1967; Chesson 1994), strongly marked interspecies competition for food can be expected between two closely related species. Lack of clear food selectivity in C. plumosus and C. balatonicus might indeed lead to the conclusion that the larvae compete for food. In the studied lagoons, however, the strength of the interaction can be substantially weakened by several factors including: (1) exceptionally favourable food conditions for benthic chironomids in both highly eutrophic lagoons, (2) the ability to occupy various areas depending on salinity, (3) different feeding behaviour, (4) the ability to ingest particles of different sizes. The results of this study which show the ways in which different species can minimise interspecies competition are convergent with those presented by other authors in freshwater habitats (Dole-Olivier et al. 2009; Galizzi et al. 2012; Butakka et al. 2014). The study was carried out under the State Assignment to the Shirshov Institute of Oceanology, Russian Academy of Sciences, Topic No. 0149-2019-0013, as well as a part of statutory activities of the Department of Fishery Oceanography and Marine Ecology of the National Marine Fisheries Research Institute, project acronym Dot18/Lagoon. E. Supiniene (Environmental Protection Agency Marine Research Department, Lithuania) and Dr. Aleksander Drgas (National Marine Fisheries Research Institute, Poland) kindly helped in collecting the material. 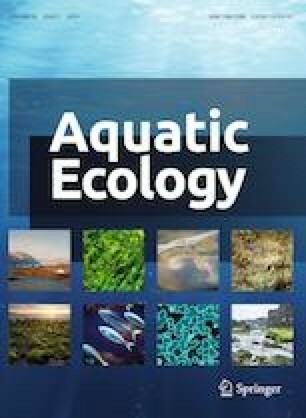 The authors are grateful to Dr. Elvira de Eyto, Marine Institute, Furnace, Newport, Co. Mayo, Ireland, and to two anonymous reviewers for their constructive comments at the early stage of the manuscript.